I want my players to take risks. Games are always more fun when the fighter wants to climb up the dragon’s back and hack it to pieces as it flies through the air instead of just shooting a longbow at the beast from a safe distance. Yet many players take the latter option and play it safe. So how does one encourage players to take risks? Fifth edition Dungeons and Dragons introduced the advantage and inspiration mechanics for just this kind of thing. Why roll one d20 when you could roll two? The following excerpts are from the free fifth edition Dungeons and Dragons Basic Rules. Your DM can choose to give you inspiration for a variety of reasons. Typically, DMs award it when you play out your personality traits, give in to the drawbacks presented by a flaw or bond, and otherwise portray your character in a compelling way. Your DM will tell you how you can earn inspiration in the game. 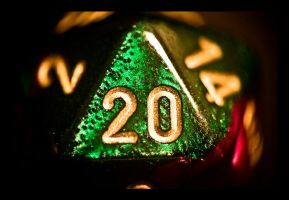 So granting advantage on a PC’s ability, attack, or saving throw roll or giving a PC inspiration gives a bit of a security net in an extra d20 that encourages that player to take a risk. Some good examples of when to grant advantage and inspiration are in the Basic Rules and Player’s Handbook, but there are other plenty of other opportunities for DMs to grant these gifts. Be consistent and fair in your dolling out of advantage. If one player gets advantage for giving a great description, make sure another player gets advantage in similar circumstances. Once your players catch on to when you grant advantage, they’ll feel a little more secure in taking risks. …a player provides a good reason. We’ve all heard from the player who constantly asks, “Can I get advantage on this attack?” My response to this question is, “Why?” If the player gives me a compelling reason (like I know this enemy fears spiders and I’ve got a tarantula on my shoulder or the dagger I’m attacking this monster with was hidden in my sleeve until I made the attack) I’ll go ahead and give the advantage. The player doesn’t have to ask. If I can see a good reason to grant advantage on a check (like the monster you’re trying to intimidate just watched you murder its ally) I’ll go ahead and give it. …a player gives a great description of its action. When a player describes an action in a way that really moves me or paints a great picture, I’ll grant that action’s roll advantage. If the bard gives a speech to gain a king’s support against orc invaders and that speech moves me, that PC has advantage on the Charisma (Persuasion) check. If the rogue describes diving behind an overturned table by kicking off the chest of a foe and it makes my heart pound, that PC has advantage on the Dexterity saving throw against an enemy fireball. Not only does this encourage your PCs to take risks, but they build the story with their actions beyond rolling dice. …the action is tied directly to the PC’s background. If a character with the criminal background risks life and limb by intimidating the master of the thieve’s guild based on the PC’s past reputation, that Charisma (Intimidation) check has advantage. These actions need to be deeply tied to the specific PC’s background in order to fly with me (for instance a character with the soldier background doesn’t get advantage on every attack). When awarding inspiration, remember the same rules as granting advantage apply. Be consistent and fair in your inspiration giving and your players will soon be taking more risks. …a player role-plays well. This is why inspiration was created. If players have an exceptional role-playing experience which gives me some good laughs, cries, or other feels, the PCs involved are given inspiration. …a player takes a big risk. If a player takes a big risk (like the aforementioned climbing onto the back of the dragon), I’ll grant that player advantage BEFORE rolling for the risky action. That way the player can choose to use inspiration to gain advantage on the risky action. …a players does a stupid thing in character. Sometimes a PC makes a decision the player knows isn’t the best choice, but is in keeping with the character created. A greedy PC might go opening chests before checking for traps and a prideful PC might attempt to beat up the much larger half-orc at the bar for name-calling. My one criteria for these stupid actions is that in order for the player to gain advantage the action must only put that player’s character at risk. I don’t need my PCs stabbing each other to gain inspiration. …players ask for themselves. Inspiration is a new mechanic. Sometimes I forget about it! So I told my players if they think they are deserving of it, they can ask for it. If they ask and meet any of the prerequisites above, I’ll let them have it. This idea was taken from Mike Shea of slyflourish.com. …players ask for others. Just like I forget about inspiration, my players might forget to ask. That’s why anyone can ask for anyone else at my table, because at any given moment someone will remember it’s a thing we should be using. Of course there are rare times an automatic success is called for. Again consistency and fairness are called for here and I only grant automatic successes on ability checks, not attack rolls or saving throws. When players see there are ways to immediately succeed, they may take all kinds of risks to get that automatic success. …a player has a trump card. PCs looking to strike a pact with the corrupt mayor automatically succeed if they bring a large enough bribe. The barbarian looking to intimidate the white dragon automatically succeeds by dropping the dragon’s mother’s head at the beast’s feet. The rogue opening a door doesn’t need to pick the lock when a key is on hand. These are the kinds of trump cards which grant automatic success. Note all involve risks to acquire. The mayor’s bribe requires the PCs to earn gold in some way, the white dragon intimidation involves slaying a larger dragon, and the rogue must steal the key before opening the door. …a player provides a five-star description of an action. I mean really, really stellar. I don’t need to be moved to tears, but I should come close. If a description is just great, it gets the player advantage. It needs to be a perfect description for me to grant automatic success. These kinds of descriptions happen once a session or less in my games. …a player must succeed or the action is boring. This method doesn’t really inspire taking big risks, but if the player must succeed on the check to move the story along (like learning the location of a nearby dungeon) or if the action is boring and there’s no outside source of pressure (like having all the time in the world to climb a knotted rope), the player automatically succeeds.